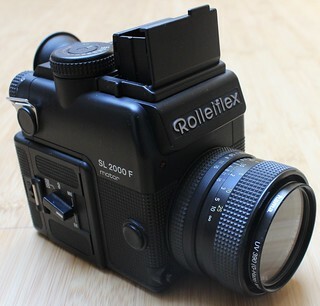 The SL2000F is a 35 mm SLR camera, introduced by Rollei in February 1981 in Europe, and later in the rest of the world. 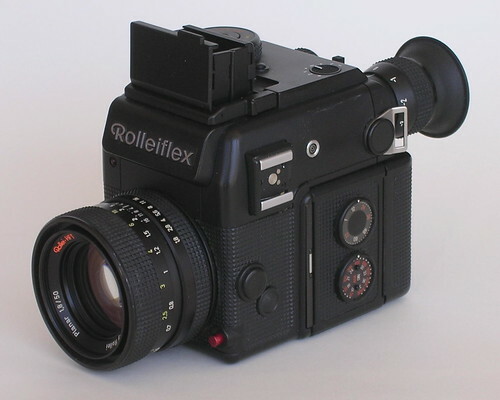 It was first introduced as the Rollei SL 2000 at the 1976 Photokina. The camera has an outward resemblance to a typical medium format SLR camera of the same era. Its innovations included a dual viewfinder for eye-level or waist-level use, and an integral motor drive. Regarding the "very unusual shape and feel" of a camera primarily for eye-level use, Bob Schwalberg of Popular Photography at the time pointed out that the advertised pistol grip only was useful for horizontal compositions, and that the Rollei designers should have "made a more detailed study of normal human dexterity before finalizing the SL 2000 F architecture". The camera has a focal-plane shutter with speeds 16 seconds to 1/1000 second. Flash synchronisation is at 1/100 second. It has aperture-priority automatic exposure, with ±2 stops of exposure compensation. The viewfinder display includes both the selected aperture and shutter speed, and over/under-exposure warnings. A range of Zeiss lenses, from 16 mm to 200 mm conventional lenses, and 500 and 1000 mm mirror lenses, was made for the camera with Rollei-HFT coating (itself licenced from Zeiss), and also a range of Rollei's own, somewhat cheaper Rolleinar lenses. The SL2000F was the only 35 mm SLR of its time to offer interchangeable film magazines. A 35 mm film cassette is loaded into an insert, which is then fitted into the film magazine. The magazines have dark-slides, making it possible to change from one magazine to another mid-roll. The film speed is set on a dial on the magazine, so no adjustment is needed when changing from one to another. 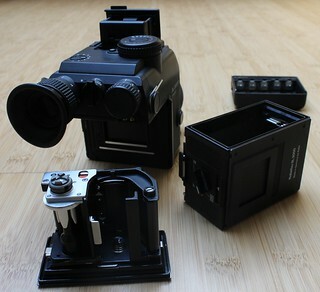 There is an interlock that prevents the film magazine from being detached if the dark-slide is not in place. Film advance is by the built-in motor drive; rewind is still manual, however, with a folding crank on each magazine. The battery holder attaches to the back of the film holder: the camera requires five AA-size cells, rechargeable or alkaline. SL2000F outfit including camera body serial no. 723410132, Zeiss Distagon 35 mm f/1.4 and Planar 85 mm f/1.4 and pistol grip, sold at the 22nd Westlicht Photographica Auction, on 24 November 2012. A prototype still-video camera based on the SL2000F was also sold at the same auction. This page was last edited on 29 April 2017, at 06:38.